Hello! Hope you are having a wonderful Thursday! I am so excited that Thanksgiving is almost here and it's time to start getting Christmas cards finished and mailed. I absolutely love making Christmas cards and love receiving them too! 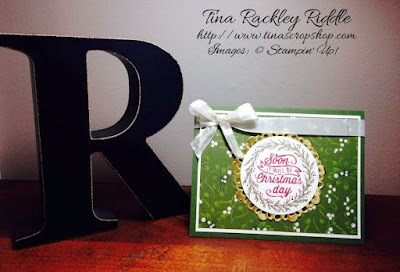 D's Stamping Team USA's Christmas Blog Hop is here with some inspiration for you! If you have already been hopping you should have landed here from Jen Guarino's blog! Isn't she fabulous? Here's my card using the Cup of Cheer Stamp set and the Home for Christmas Designer Series Paper. I have to tell you that I absolutely LOVE the Home for Christmas Designer Series Paper! There are so many awesome designs. The one I used today is one that I haven't seen used much yet but it is such an awesome vintage look to me! I started with an A2 Mossy Meadow Cardbase. I topped that with a layer of 5 1/4" x 4" Very Vanilla Cardstock and then layered with a 5" x 3 3/4" piece of DSP. I used sponge daubers in Mossy Meadow and Cherry Cobbler to apply the ink to my stamp from the Cup of Cheer Stamp Set and then stamped it on Very Vanilla Cardstock. I punched it out with a 2 1/2" circle punch and then backed it with one of the awesome Gold Foil Doilies. I ran a piece of Very Vanilla seam binding across the top of the card and tied it in a bow. I really love that it looks like such a pretty classic Christmas card. I believe this one is a winner! Hope you like it too! I hope you'll continue hopping by stopping by Jeanne Moss's awesome blog! Just click the next button and you'll be there! Your projects are always so gorgeous! so sweet... thanks so much Deb! Love the gold foil doily used on your pretty card! Thank you Nancy! :) I love those foil doilies! I love the doily, just like everyone else! Very pretty, Tina! But, I always love your cards! Thanks Jeanne :) Very sweet of you! I don't think I've seen any cards with this stamp set, so this is super great to see something different! Cute and simple! I love it!! I've been looking for ideas for those metallic doilies. Thanks! !